Here’s what I’ve learned from 5 years on the road, travelling and trading. With the Labor Day long weekend coming up I thought I’d do something a little different. My wife and I are getting on a plane Monday – heading off for our annual 3 months of Autumn swells in Biarritz, France. But the Emini trading doesn’t stop. Here are my 8 tips for travelling and trading while on the road. Airports, airplanes, security, customs, foreign languages, driving on the other side of the road, etc. are all stressful enough. Why make it any harder on yourself? I stop trading a few days before I travel and close out any open positions. I don’t want to be checking or worrying about the market while I’m travelling. I want to reach that “zen-like-state” where I don’t care if the flight is delayed, if my luggage doesn’t arrive, if I’m seated beside the chatty grandmother or competition bodybuilder (yes, it’s happened to me – I was sandwiched between 2 of them). I think I’m a little different from the average trader when it comes to trading screens – I only need one. To be honest, sometimes I think traders use multiple screens as a badge of honour or a way to feel important. Is that sacrilege? Have I just crossed a line? I try and keep things simple – minimize the number of trading decisions, minimize the number of variables to monitor, minimize the “noise” and outside influences. I focus exclusively on and trade one market, I only use 3 non-correlated indicators and most of the time I have just one workspace open – my 500, 1,500 and 4,500 tick chart setup. I have travelled with 2 laptops in the past but it’s really not necessary. If you do choose to do that, take the battery out of one and run it just on mains power. That will cut down on travelling weight – although your fellow travellers do look upon you with some suspicion when passing through security. I am in absolute awe of my 17 inch Apple MacBook Pro – flawless. So I’ll be travelling with that this year. If you’ve ever wanted to get off the Microsoft treadmill but were a TradeStation die hard (like me) then read this article on Trading Software for Mac. A solid, fast Internet connection is a must. These days WiFi is becoming ubiquitous – which means fewer plugs and cables to carry with you. But the speed and reliability of your WiFi connection can still be an issue. Before we book any accommodation while travelling we always check the speed and type of Internet connection. For example, 3G mobile or (God forbid) satellite Internet connections will not cut it. Some of the apartment landlords are a little bemused with the questions – but don’t be put off. A poor Internet connection will ruin your stay. In my experience, the French Internet infrastructure is excellent. A friend of mine who’s in-the-know, told me that Biarritz in France, where we stay, was one of the first places in Europe to get high-speed Internet. And frankly, I was blown away at how good it is. Spain is patchy and lots of landlords try to pass off 3G mobile Internet as high speed. I’d love to spend more time surfing in Indonesia – but you can barely get better than dial-up there, so that one will just have to wait. Try to always use the same Internet speed and quality testing services – that way your measurements will be consistent. My favorite service is SpeedTest.net for measuring the download and upload speeds. Very simple and you can save your test data there too. The absolute minimum Internet connection speed for trading is 5 Mbps. But I prefer a lot more than that. In Australia (home) we get 80+ Mbps, France 25+ Mbps and Hawaii 15+ Mbps. If you’re renting an apartment, ask the landlord to test the Internet speed using this service. That way you’ll know exactly what you’re getting into. Don’t trust what their ISP says – they always lie. Did I say “lie”? I meant to say “overestimate”. I used to fuss about which electrical power adapters and cables I needed when travelling. Not any more. WiFi has eliminated cables and now I travel with 2 universal power adapters. The beauty of the universal adapter is you can connect any plug to any outlet. 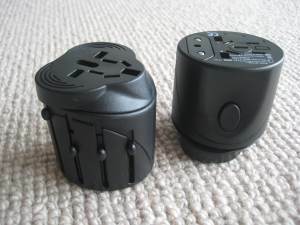 Choose a well designed, small adapter with surge protection and you should be able to manage most countries. Again, in the past I’ve travelled with a dozen or so application disks – just in case disaster struck. With most software downloadable from the Internet these days (like TradeStation), this is less of an issue. However, I still travel with my operating system backup disks and some spare CD-ROMs. Last year I had to do a full system backup and re-install on my wife’s computer – and it was surprisingly easy. I’ve now started travelling with a long Ethernet cable with RJ45 connectors – also called a CAT5 cable. I’ve been tracking my charting platform data connection and noticing micro-outages, just for a couple of seconds. These appear to be a result of the WiFi connection. So now I turn off WiFi on my Apple MacBook Pro and connect directly into the WiFi router with the CAT5 cable. And it seems to fix the problem. Travelling with surfboards is a real pain in the neck. It’s worse than golf clubs, bikes or skis. The worst bit is getting on that rental car courtesy bus – your fellow travellers feel compelled to strike up a conversation and ask you “is it really worth it”. Well, this year I’m buying (and then re-selling) locally. Biarritz has a couple of awesome surf shops and they stock a full catalogue of the best Australian and US shapers. And we’re staying long enough to make it worth my while. Not a surfer? The same principles apply. If you can’t work or trade without a printer – buy locally. Printers are getting so cheap they’re almost a disposable item! You might think about the same thing with a second screen. Then there’s the weekend ski trip that happens to be on the way to/from your destination. If you’re like me and you can’t bear to ski/board without your own boots and gear then think about boxing them up and shipping them ahead to your hotel. It just takes a little planning. Ok, so the secret to stress-free travelling is to travel light. But what is the secret to travelling light? Answer: shoes – travel with the minimum number of shoes. And the shoes you take have to be ultra-comfortable, lightweight and versatile. This is where you start to see my obsessive, compulsive streak. I am obsessed with finding the ultimate pair of shoes (and luggage, more about that below). I’m fortunate that I don’t need to attend business meetings or wear suits. And the winner is … Ecco. You might have heard of them – Fred Couples (former World number 1 golfer) wore a pair of Ecco golf street sneakers at the 2010 Masters. They’re a small but growing Danish shoe manufacturer that specialise in ultra-comfortable and somewhat quirky looking shoes. Anything from loafers to hiking boots. I have sandals and travelling shoes from Ecco. The Ecco Ultra Terrain are amazing – lightweight, mesh construction that makes them breathable and they’re slip on/off for getting through security quicker. Remember that George Clooney scene in Up In The Air? “Asians. They pack light, travel efficiently and they have a thing for slip on shoes”. More of my obsessive, compulsive streak. I am also obsessed with finding the ultimate luggage – strong, lightweight, no bigger than you need. Samsonite is an obvious choice. They’ve got a great world-wide warranty policy and are on the cutting edge of lightweight, strong materials. I’ve had my Samsonite shown in the picture for 8 years and it’s been around the world almost that number of times. But I’m most excited about my latest laptop briefcase. It’s a Patagonia Lightwire Brief. My 17 inch MacBook Pro laptop fits perfectly, plenty of easy-to-access pockets, nicely designed shoulder strap and made from very strong ballistic fabric. But it’s most important feature? It’s ultra-lightweight. I’m just itching to test it out. By the way – the picture shows all the luggage I’m taking for 7 months on the road. The trick to keeping things to a minimum is to have a packing list. When you unpack from your last trip keep a list of everything you used and nothing more. You always take more than you absolutely need – the packing list will keep you straight. Time to upgrade my Samsonite luggage. My old case had done sterling duty and lasted well over 10 years. Decided to go with Samsonite again, this time the Cubelite collection (which I don’t think is available in the US). Very light and very strong. The second choice was Rimowa, from Germany. It was a very close thing – but ultimately the Samsonite was lighter. The Patagonia Lightwire Brief has worked out well. But the handle did have to be re-stitched onto the case as I’d overloaded it too many times. Time zones can play tricks on your mind. I find that once I arrive in a new location, the trading day initially has a very different feel. The Emini open is happening at a different time of day than I’m used to. In Europe it’s late afternoon; in Hawaii it’s very early morning. Your mental state, not just your physical body, needs time to adjust. It’s easy to rush in and confuse the feeling of a different mental state with the feeling of excitement you get when a trade is setting up. If I were a patient man I’d say wait a few days before dipping your toes in the water and taking a trade. But that’s not what I do. The best advice I have is to halve your profit target and stop loss. Normally I’m gunning for 4 points and risking 4. When travelling, I start by playing for just 2. Because I’m much more likely to make a mistake in these first few days, I also limit my risk. I’m not sure it’s possible to trade with just a 1 point stop, but about 2 points is right for me. I also limit the amount of time I spend watching the market – it’s easy to convince yourself of a setup when your body is running on adrenaline. To make good decisions you need to have minimum background mental “noise”. Part of reducing this “noise” is not having other variables running around in your head – where shall we have dinner? did I get the right rental car? what’s the weather going to be like tomorrow? Drop these external influences from your mind while you’re trading, they distract you from the job at hand. Stick to places you know – you’ll settle quicker. And stay as long as possible in the one spot, don’t move around. I’ve found 3 months is an ideal amount of time in a new location – enough to settle in, not long enough to get bored. If you plan to combine travelling and trading I hope you found these tips helpful.